Yesterday, Private Bradley Manning was convicted of 19 out of 21 charges for his release of classified information to the media. If given the top sentence for each count, Bradley Manning will be sentenced to over 130 years in prison. 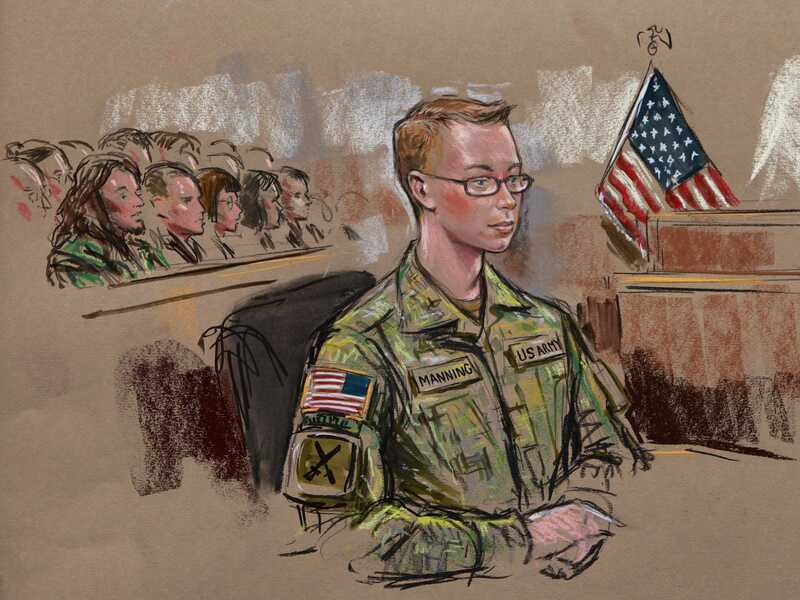 Today, the sentencing phase of the trial begins and the colonel who presided over the trial (as well as decided the verdict) will hear witnesses in order to determine what Manning’s eventual fate will be. This resolution to the Bradley Manning case is a terrible miscarriage of justice and indicative of a larger attack on people who would promote accountability to power. Not only is Bradley Manning a whistleblower who should never have been charged with a crime, but those who committed the crimes that he exposed have been allowed to walk free (without as much as an independent investigation). While Manning was not found guilty on the top count of “Aiding the Enemy”—thus preventing the government from executing him—his pre-trial mistreatment and conviction send a very serious message to potential whistleblowers: If you leak information which harms or embarrasses the administration, you will be charged in a draconian manner and face life in prison. By mistreating, overcharging, and imprisoning Manning, the government has used him as an object lesson to dissuade people who would dare become whistleblowers of government misdeeds. To me, this is no different than when criminal enterprises use “snitches get stitches” paraphernalia to intimidate witnesses to crimes. In both cases, an organization which is engaged in criminal activity is trying to silence those who reveal criminal conduct by its members to the proper authorities. Manning leaked a large quantity of information to the media, including proof of war crimes which the United States military had illegally covered up. The “collateral murder” videos clearly showed American helicopter pilots shooting at unarmed civilians—including children, journalists, and first responders. These killings were not on a battlefield and they were a clear violation of several international agreements on conduct during war (ex. Article 85 of the Geneva Convention). It is illegal to cover up war crimes and Manning should not have been prosecuted for his attempts to circumvent the chain of command after his superior officers made it clear that they wouldn’t look into the incident (in fact, it would have been illegal under international law if Manning were to be complicit in the cover-up). Despite the letter of the law in this situation, the officers who illegally covered the events up have not, and will not, face charges for their actions. In a fair world, Manning should be free today and those who committed or covered up war crimes should be in jail—unfortunately, the world isn’t fair and Manning is now serving time for committing the terrible “crime” of embarrassing those in power. The Arab Spring: While Manning doesn’t deserve sole credit for the Arab Spring, his leaks were a major factor in their initial formation. By revealing proof of the corruption of governments, Manning helped catalyze the democratic protests in the Middle East which led to the toppling of several long-standing dictators. If anything, the USA should be thanking Manning for his part in furthering the USA’s stated goal of promoting democracy in the Middle East (not that anybody actually believes that democracy is really a priority to those in power). Embarrassment for US Military Leaders: The revelation of war crimes and bad conduct by the military, as well as how the military illegally covered up said crimes, was a major embarrassment to the US military. Unlike with other, government-sponsored, data-leakers (ex. the “unnamed Whitehouse official” who leaked the existence of the kill list and STUXNet virus), Manning leaked things which the government didn’t want revealed, thus he became a target for retaliation. At no point has any government official been able to link Manning’s release of information with any blown covers or operations. Officials and politicians have certainly made the blanket claims that Manning’s actions caused harm to the USA but, when pressed for details, they are unable to give specifics or they default to saying that such evidence is classified. Because Manning admitted to his “crimes” before the trial, much of the prosecutor’s case was focused upon proving the “aiding the enemy” charge. This charge was based upon the unprecedented claim that, because Bin Laden and other terrorists read the news and received publically-available information, Manning was guilty of directly passing information to terrorists. Under this interpretation of the law, every journalist who reports information which is not officially sponsored by the government becomes a potential aider and abettor of espionage. “Yet they decided to prosecute Manning who it seems was trying to do the right thing – reveal credible evidence of unlawful behaviour by the government. You investigate and prosecute those who destroy the credibility of the government by engaging in acts such as torture which are prohibited under the US Constitution and in international law. 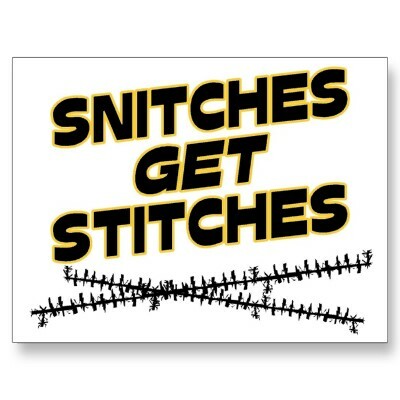 In the “stop snitching” and “snitches get stitches” campaign, criminals use t-shirts and threatening language to intimidate people into not reporting their crimes. By invoking a threat of consequences, these criminals hope to dissuade well-meaning people from reporting their crimes to those who can punish them. With the persecution of Bradley Manning, the government is waging its own “stop snitching” campaign, only, instead of stitches, people who “snitch” on the government to the American people face life in an 8×12 cell. While it is unrealistic to hope that President Obama has enough principled integrity or bravery to do so, Obama should immediately pardon Bradley Manning (as Bush did with “Scooter” Libby after his trial) of all crimes and open an independent investigation into the war crimes perpetrated during the Iraq and Afghanistan wars. It is certainly true that Manning violated numerous military rules and should have been immediately discharged after the leaks came to light, but he should never have seen the inside of a courtroom. The charges and the court proceeding should be overturned for lack of jurisdiction, both personal, and venue (place of trial). Listed below are the charges against Bradley Manning from Wikipedia. All the charges stem from violations of the UCMJ, the Uniform Code of Military Justice, which has absolutely nothing to do with a person in the Military. Furthermore the “ Armed Forces”, created in 1949, is not the Military. Congress duty bound to regulate the Military, both in war and in peace, wrote the Army Field Manual. In time of declared war, the last being W.W.2. According to the Army Field Manual a person in the military, in times of war, could be tried in a military court, due to the circumstances, for expediency. The exception being without a declared war, the defendant was to be tried in a Court of law, with a jury. The major break from the rigid requirement of the Army Field Manual occurred in 1801-02, to address personnel that were not in the military, but might commit a crime while accompanying the military. The Army Field Manual and the creation of the Uniform Code of Military Justice (UCMJ and the MCA) for non-military personnel. President Adams appointed Williams a major in the Corps of Artillerists and Engineers in February 1801 and President Jefferson made him the Army’s Inspector of Fortifications and assigned him to lead the new Military Academy at West Point in December 1801. The following year Jefferson appointed him to command the separate Corps of Engineers established by Congress on March 16, 1802. Mr. Jefferson, didn’t dissolve the Army, he created a military appendage. The Army Field Manual was not modified by section 1342 listed below, section 1342, modified the 1802 Act, dated March 16 1802, it eliminated the Military, it was codified on Aug. 29, 1916, c. 18, § 3, 39 Stat. 650.) amended in 1948, by the Elston Act. (comment) This secretary of war was not the military; this office secured military weapons for the military. In a letter submitted by HENRY L. STIMSON, the Secretary of War, to the Military Committee, House of Representatives, stated the purpose for the needed change. to the Congress with a request for its enactment. The necessity for revision will be best understood by a preliminary reference to the history of the present articles. the field of Army Regulations. The Military is omitted by section 1342 of the articles of war. OLD ARTICLES OF WAR OMITTED FROM THE PROPOSED REVISION. Section 1342 of the Articles of War, eliminated the Military, the Articles were codified Aug. 29, 1916, c. 18, § 3, 39 Stat. 650.) Philippine Islands. The request for the change came from the “*Bureau of Budget“(*Commodity Credit Corporation). The Elston Act, modifying section 1342, became the UCMJ. 801 50:551 (less (9)). May 5, 1950, ch. 169, § 1 (Art. 1 (less (9))), 64 Stat. 108. The Uniform Code of Military Justice of 1950, 64 Stat. 107, as amended by the Military Justice Act of 1968, 82 Stat. 1335, 10 U.S.C. Sec. 801 et seq. For prior acts, see 12 Stat. 736 (1863); 39 Stat. 650 (1916). effective in 1951, , later codified by Act of Aug. 10, 1956, ch. 1041, 70A Stat. 1, 36, and now, as amended, 10 U.S.C. $5 801-940 . Section 38, act June 15, 1917, ch. 30, title I, § 7, 40 Stat. 219, related to jurisdiction of courts-martial and military commissions. (question) Is this all archaic history, lost to a bygone era? Hardly, here’s a recent law that makes the distinction. The Department of Defense is the former War Department, still not the military. “SEC. 1402. UNIFORM STANDARDS FOR THE INTERROGATION OF PERSONS UNDER THE DETENTION OF THE DEPARTMENT OF DEFENSE. “(a) In General.—No person in the custody or under the effective control of the *Department of Defense or under detention in a Department of Defense facility shall be subject to any treatment or technique of interrogation not authorized by and listed in the United States Army Field Manual on Intelligence Interrogation. “(b) Applicability.—Subsection (a) shall not apply with respect to any person in the custody or under the effective control of the Department of Defense pursuant to a criminal law or immigration law of the United States. The only conclusion that can be drawn from the above Public Law is that the Department of Defense does not have to abide by the Army Field Manual, because the Department of Defense is not the military. In fact the Department of Defense is a chartered corporation. Bradley Manning is being charged by the Department of Defense, in clear violation of the law, for exposing the machinations of a Corporation, that has hijacked the military, this is the real crime of espionage. Furthermore, the UCMJ has no jurisdictional application in the several states, much less against a person in the military. 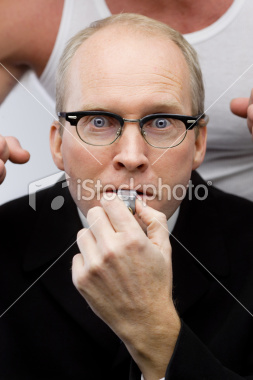 He’s entitled to a trial in a court of law, with a jury.